Canadian Motorsport Hall of Fame member, accomplished SCCA Trans-Am, IMSA, and American Le Mans Series driver, and a NASCAR "road course ringer", born in Windsor, Ontario, Canada. Fellows at the age of 4 he became interested in auto racing with his family. He began his career in Karts, which lead to Formula Ford 1600 and Formula Ford 2000. When funds for these projects ran low, he left racing for a 9 year stint as gas pipeline worker. Fellows returned to the track in the 1980s with help from driving school instructor Richard Spenard. He made his professional debut in 1986 in the Player's GM Challenge, driving a showroom stock Chevrolet Camaro. He had a dominant 1989 season, capturing both the title at Mosport Park and his first SCCA Trans-Am Series race during the same weekend. His career skyrocketed as he became one of the most successful drivers in the history of Trans Am, with 20 wins in 100 starts, with the last win at his home track in May of 2014, after a lengthy 10 year lay off. Fellows then had 2 starts in the legendary Ferrari 333SP, including a 1997 win at Mosport Park in the IMSA GT Championship. In 1998, Fellows began his long association with GM's Corvette Racing program, with the historic Chevrolet Corvette C5.R. He was also briefly involved with the development of the Cadillac LMP program. In 1999, Fellows had his career-best NASCAR finish at Watkins Glen driving the #87 Bully Hill Vineyards Chevy for Joe Nemechek. In his only scheduled NASCAR race for 1999 for the Frontier at the Glen, Fellows led 3 laps, but was beaten by Jeff Gordon on the final restart. At the 2000 Rolex 24 at Daytona, he made history by setting the closest margin of victory in the history of the event, 31 seconds behind the winning Dodge Viper GTS-R of Olivier Beretta, Dominique Dupuy and Karl Wendlinger. Fellows and Corvette Racing fared better the next year, winning overall with Chris Kneifel, Johnny O'Connell, and Franck Freon. 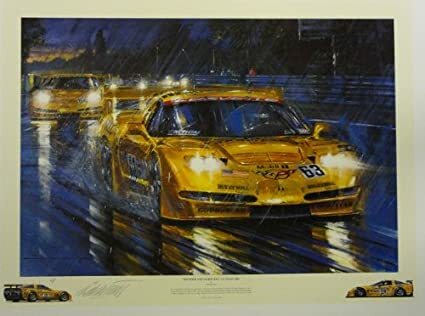 Later that year in June, Corvette Racing achieved its ultimate goal, a GTS class win in the 24 Hours of Le Mans, with Scott Pruett and Johnny O'Connell. Corvette Racing also captured the American Le Mans Series GTS title that same year. In 2002, the Corvette C5.R once again dominated the American Le Mans Series season, with a GTS class win at the 12 Hours of Sebring, along with a repeat of their 24 Hours of Le Mans GTS class victory. For the 2003 season, Corvette Racing won the American Le Mans Series GTS title with a very close down to the wire fight with the Prodrive Ferrari 550 team. In 2000, Fellows was in talk with Dale Earnhardt about driving for Dale Earnhardt Inc. full-time after 2001. When it appeared that the full-time deal was sealed up, Earnhardt was killed during the 2001 Daytona 500 which left the deal invalid. In 2003 however, Fellows was remembered by Ty Norris, the DEI co-owner, and he was hired for the road races to drive the #1 Pennzoil/Nilla Wafers car. At Infineon, during the Dodge/Save Mart 350, Fellows had his career's nearest-miss. Fellows started third, and took advantage of a battle between Richard Childress Racing teammates Robby Gordon and Kevin Harvick to take the lead. Fellows led a lot of laps, and controlled the race with less than 70 laps to go. However Fellows had his sure-win end for good after being called into pit road just after an untimely caution came out with 38 laps to go. Restarting 31st, Fellows finished 7th. In 2004 Corvette Racing continued to dominate the American Le Mans Series GTS class, including another GTS class win at the 12 Hours of Sebring. Fellows also competed in one NASCAR Nextel Cup race at Watkins Glen, where he had one of his greatest performances. Because qualifying was cancelled due to rain, the lineup for the Watkins Glen event was decided by owner-points. Fellows started 43rd and finished second behind winner Tony Stewart. Fellows did challenge Stewart on the final restart but all of his speed was worn out by his charge through the field. In 2005, Corvette Racing debuted the revolutionary Chevrolet Corvette C6.R at the 12 Hours of Sebring, with high expectations. A tire blow out erased their chances of capturing the GT1 win, with the Prodrive Aston Martin DBR9 taking the class win. However later that year, the tides would turn as Corvette Racing won their 3rd 24 Hours of Le Mans class title in 6 years, beating the Aston Martin DBR9's with superior reliability and strategy. Although Fellows was not driving the winning Chevrolet Corvette C6.R, he ran a respectable race in the #63 car. In 2006, Fellows returned for a full season with Corvette Racing. However, a dark cloud loomed over the 2006 season as a result of the controversy surrounding IMSA's performance balancing. Corvette Racing's opposition during 2006 was the Prodrive Aston Martin team, which ran two full-season cars on Pirelli tires. The Pirelli tires were their Achilles heel, as they were not as competitive as the Michelin tires on the Corvette. Prodrive expressed their disdain for their disadvantage, and IMSA, the ALMS sanctioning body, introduced a number of penalties for the Corvette Racing team, to 'balance' the performance. Despite this controversy, Fellows remained optimistic and still carried himself with the professionalism and class for which he is known. Despite the penalties, Corvette Racing prevailed, winning their fifth ALMS championship. Corvette Racing also went on to win their fourth 24 Hours of Le Mans in six years. However, Fellows did not have the best luck in 2006, with the title going to the sister car driven by Jan Magnussen, Olivier Beretta and Oliver Gavin. In NASCAR, in 2005 and 2006, Fellows drove the #32 Tide car for Cal Wells and PPI Motorsports at Infineon and Watkins Glen. After starting 43rd at Sonoma he finished 8th. Fellows had a rough 2006 season and was later released by the Tide team. In 2007, Fellows joined Hall of Fame Racing as driver for the road races. In a similar performance to the 2003 Infineon race, Fellows led a bit of the race after passing in a 3-wide move, and lost the lead after having to pit during a caution. Fellows finished 15th. After starting 26th at Watkins Glen, Fellows moved up to fourth. Fellows returned to Corvette Racing in a limited supporting role for the 2007 season. He was the third driver for the three long-distance races, and competed at Mosport, his home race. He sat out the other races, providing technical input and experienced advice to the team from behind the wall. In NASCAR that season, Fellows renewed his deal for one more year to drive for Kevin Harvick Inc. in the #33 for the NBS road course events. At the first NBS race at Montreal in Canada he drove a good performance and in the final green-white-checkered finish attempt he drove from 14th place to 4th place in two laps. Earlier in his life, Fellows found a love for French-Canadian Formula 1 driver Gilles Villeneuve. Fellows has one of the biggest collections of Gilles Villeneuve merchandise in Canada and called Villeneuve his idol. To attend F1 races at a young age, Fellows went to watch them at a local track on an island in Montreal Canada named Île Notre-Dame, a track that eventually would be named Circuit Gilles Villeneuve. When Villeneuve died in 1982 the track was named after Villeneuve himself. Fellows developed a dream to win at Circuit Gilles Villeneuve when he became a racing driver. He accomplished his goal in 2008, winning the NASCAR Nationwide Series race at the track the NAPA Auto Parts 200. As a result of his big win Fellows was given the #5 JR Motorsports crew for a multi-year deal. He drove for JR Motorsports through 2009 and 2010 for the road course races. Fellows returned to the NNS in 2011 with JR Motorsports getting a NNS full-time ride for the first time since 2006. Driving the briefly renumbered #7 AER Manufacturing Chevrolet, he was in contention to win the Bucyrus 200 at Road America. He took the lead from Justin Allgaier, who had run out of fuel previously, passing Reed Sorenson in the process. However, NASCAR ruled that Fellows had passed both drivers under the caution flag way too fast. Believing that Sorenson slowed due to also being out of fuel, Fellows drove past them at nearly race speed until he was leading the caution to the pace lap, though NASCAR rules stipulate that a driver must maintain reasonable speed while under the caution flag (Speeding is not reasonable caution speed anymore). As a result, Fellows was relegated to second place post-race, handing the win to Sorenson. To this day Fellows maintains that he should have won the race. Besides his racing career, Fellows owns a corporate business chain the Ron Fellows Performance Driving Schools and is one of the owners of car brand, Corvette as well as Corvette's racing operations. He also owns a charity called the Sunoco-Ron Fellows Karting Championship to help young kids become race-car drivers. 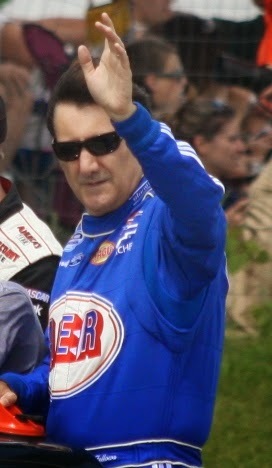 In January 2013, Ron Fellows purchased the Canadian Tire Motorsports Park racetrack and NASCAR hosted a truck series race there-the first time since 2000 that the truck series came to a road course. Fellows' current goal for his track is to bring the Cup series to the track someday. He has a wife Lynda Fellows, and 3 kids, Lyndsay, Sam and Patrick Fellows. Ron lives outside of Toronto, and like many Canadians, he has a deep passion for hockey, especially the Toronto Maple Leafs. Ron was inducted into the Canadian Motorsport Hall of Fame in 2012.